Together with our community partners, the Montgomery Age-Friendly Advisory Group envisions Montgomery County as a wonderfully diverse Community for a Lifetime, where all residents can remain and thrive as they age and be a powerful resource in making our County a better, stronger, more inclusive community for everyone. Montgomery County, Maryland, has a long-demonstrated record over many years of commitment to serving its older population of active, vital older adults as well as the more vulnerable. In concert with that commitment, the County enrolled in the AARP Age-Friendly Network of Communities in December 2015. Montgomery County is home to a large, diverse, and rapidly growing older population that makes enormous contributions to the community. Montgomery County’s senior population is expected to increase by 130% between 2000 and 2030. Seniors are a vital and important part of the County’s success, and it is critical that our increasingly diverse senior community has access to all to the available and necessary resources. A Subcabinet on Senior Vital Living, in collaboration with the Montgomery County Commission on Aging, served for many years as the primary vehicle within County government for advancing the age-friendly mission. Under the leadership of County Executive Isiah Leggett, a 2008 Senior Summit of more than 350 attendees comprised of County seniors, caregivers, public and private providers of senior services, the Senior Subcabinet, faith communities, business and academia and community stakeholders, prioritized the most critical needs for older adults in eight areas and created an action plan to address those needs moving forward. This work became the Senior Initiative, a multi-year, cross-department effort to improve coordination, community outreach, and promotion of programs designed for older adults. In the years that followed, the eight workgroups, each with its own chair, goals, and agendas, worked together under the leadership and coordination of the Subcabinet. Their work has embodied core principles of the WHO Age-Friendly cities framework. The groups were: Communication and Outreach, Housing and Zoning, Transportation and Mobility, Health and Wellness, Civic and Social Engagement, Home and Community Support Services, Safety, and Employment. 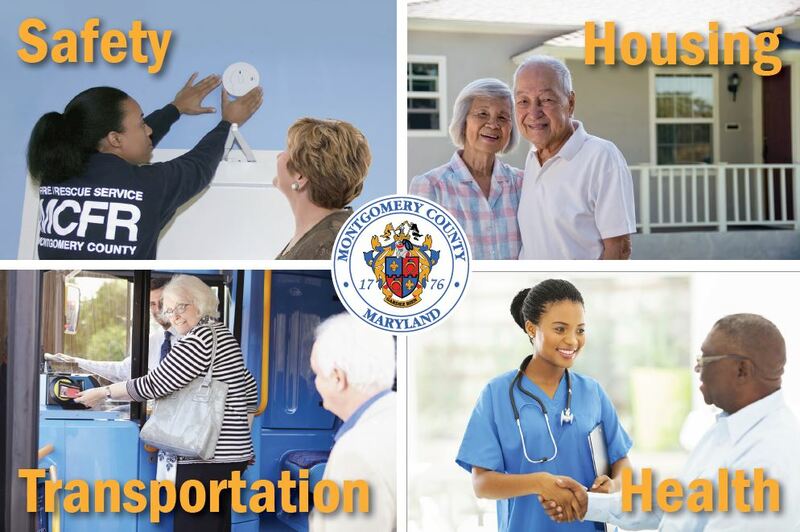 In addition, the County Executive and County Council also adopted a 2012 Senior Agenda, developed by the Montgomery County Commission on Aging. The Senior Agenda has served as a framework for the long-range goal of transforming Montgomery County into a “Community for a Lifetime” where older adults can live safe, healthy and vital lives. Since that time, the County has seen exciting changes. Not only has the older population grown and become more diverse, but also there has been enormous expansion of programs and services for older people, including: significant growth in the Villages movement as more and more communities organize to help older residents age in the homes and communities they love; improvements in accessibility to transportation, expanded library hours and services, improvements in affordable rental housing and design for senior living; expanded access and programming in our five seniors centers and recreation centers; expanded and engaging opportunities for volunteerism and lifelong learning; and a myriad of new programs and series to keep seniors health, safe, and protected against financial and other forms of elder abuse. In December 2015, the County Executive convened a second Summit on Aging. At that time, it enrolled in the AARP Age-Friendly Communities program. At the same event, the County also enrolled in the Dementia Friendly America initiative to address the needs of person with cognitive impairments and their caregivers. Age-Friendly and Dementia Friendly work is being integrated to support shared areas of effort. These groups are focusing efforts in areas of activity that support and nurture our older population in all diverse communities and backgrounds to ensure that Montgomery County is a Community for a Lifetime for all of its residents.